Hit the Ground Running: What the Heck are Flatties? When I wrote about my friend Christine taking a flattie-Ali along for a half marathon, a couple people were unfamiliar with this practice. I forget sometimes that my virtual running community on Facebook does some weird things...even for runners. The best pictures for flatties are running photos, of course. The more fun and festive the picture, the better. 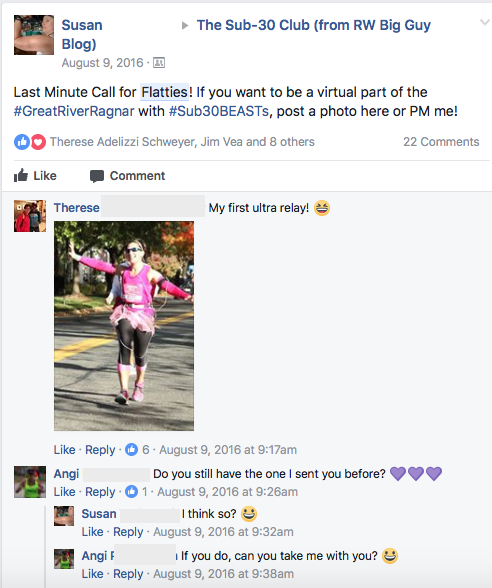 Flatties first started (for me, at least) with the Runner's World Festival in 2014. Dozens of Sub-30 members were attending the event, and those of us who were sad to miss out were hoping to somehow still participate. Someone cam up with the idea to send a laminated photo of ourselves to someone who would be at the event. That way, we could "tag along" during the races and enjoy the festivities. Jennifer's comment says it all! When I actually got to meet her at Gasparilla this year, it was like we'd already run a race together! I'm sure you've heard of people writing names on their arms and "running for" someone else...this is just a more tangible way of doing that. 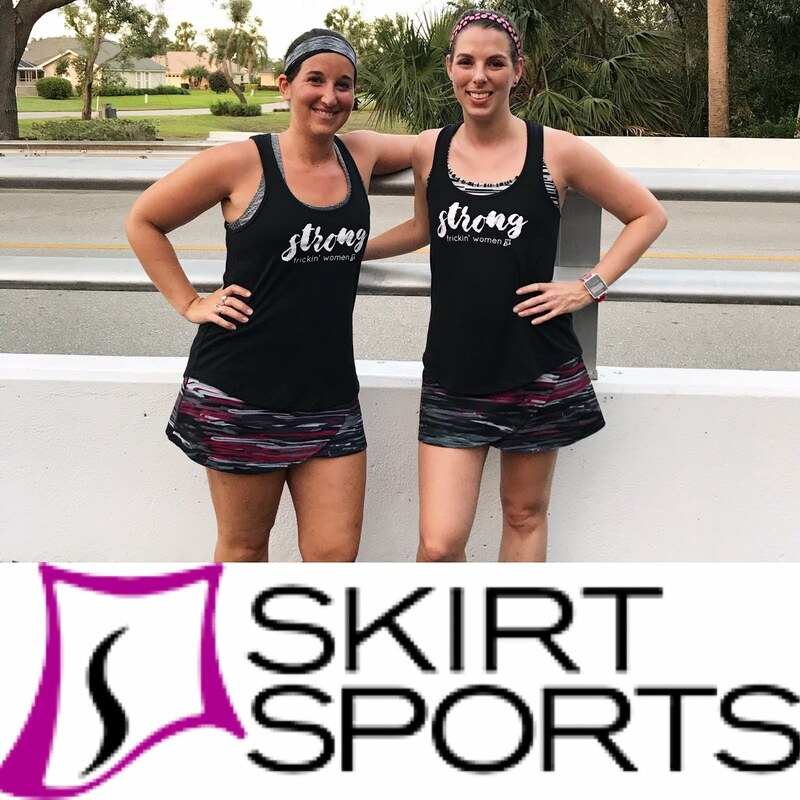 As you guys saw on the post with Christine, bringing flatties along can be a means of keeping injured runners "running" and emotionally supported. Sometimes runners bring the flatties with them during a hard race for their own motivation and mental strength. I remember one time, we sent flatties by the dozens to a friend who was having knee surgery, so he wouldn't be alone. There are lots of good ways to carry flatties. They have caught on in our group and now it's not uncommon to see someone with half a dozen or more pinned on. Running belts and Camelbaks are a great way to carry multiple flatties at once! Flatties also get to join the post-race party. They travel to new places and indulge in post-race meals. It really does make you feel like you're part of the fun! 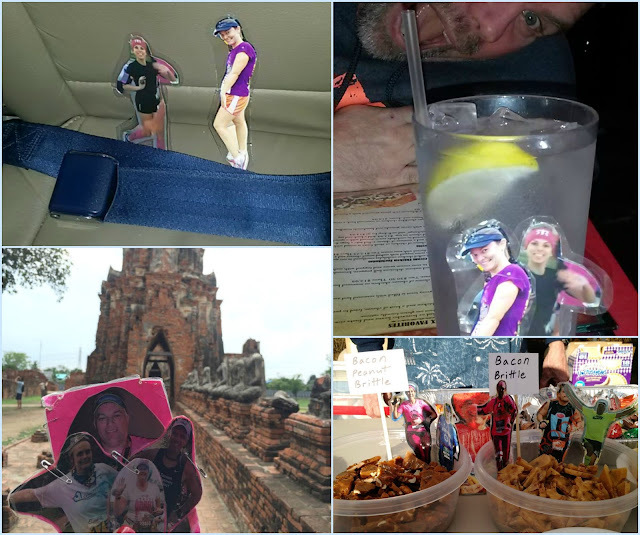 Buckling in for a flight, staying hydrated before the race, and enjoying sightseeing and post-race snacks. 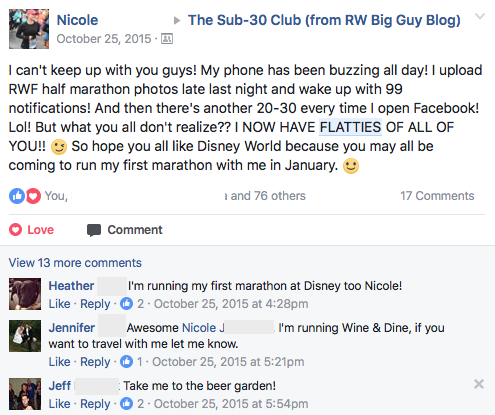 I talk about the Sub-30 Club pretty frequently here, and this is just another part of what makes this running group so wonderful. I didn't even realize this might be a strange or unique practice because it's pretty usual for the kind of fun and love Sub-30 is all about. It's such an awesome idea! 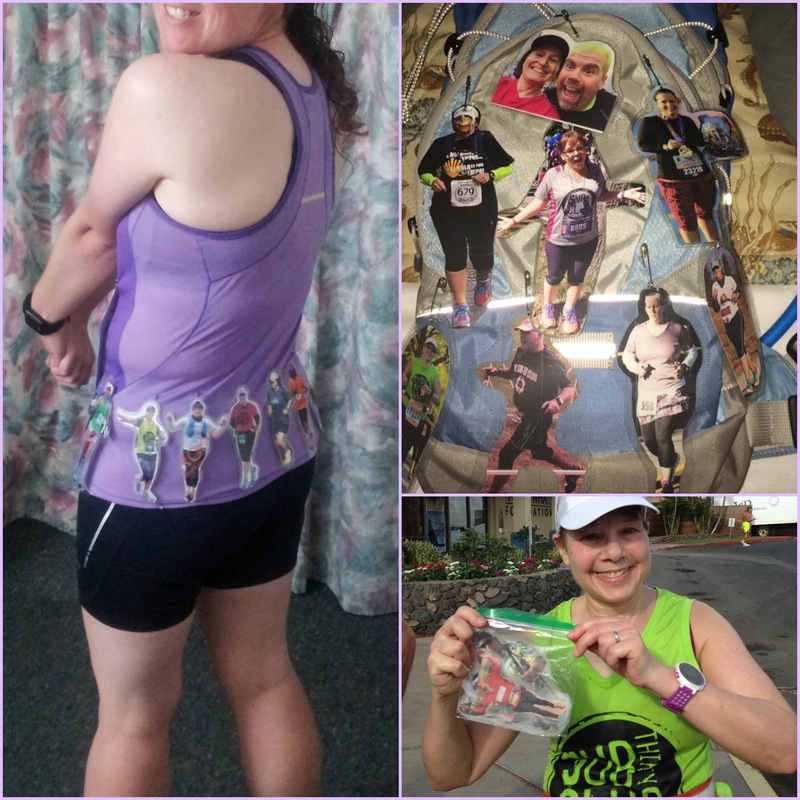 I have a friend that is running miles for me while I am rehabbing. The other day she wrote "we did 6.5 miles today...write it down". I love it and feel so supported! We really do belong to such a fabulous community of people, don't we? Such a great idea! The Sub 30 group sounds awesome! I had never heard of this nor seen it done at a race. Such a cute idea! 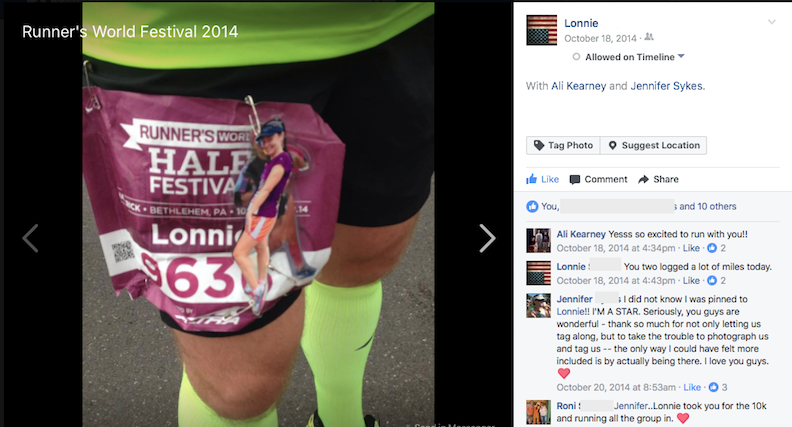 I was actually at the Runner's world festival in 2014 or maybe it was 2013! Unfortunately, trading this way won't result in a happy ending but there's a way to overcome the issue and as with anything else in living, Lucky Multi Bets the more frequently you do it, the simpler it gets. It can be inviting to pay a good deal of money for an amazing pick opportunity from among the very best. On the opposite hand, this massive sell off could be overkill. You taught me something new today!! I have not seen this before. I have seen people write in memory on their shirt or bibs but not the actual flattie!